In 1998 BNFL Magnox Generation carried out a successful programme of repairs at Sizewell A Nuclear Power Station. The repairs were carried out on the Cr-Mo-V girth welds on each of three very large reactor boilers, each weld being seven metres in diameter. This was a major undertaking the like of which had never before been attempted. In order to carry out the repairs it was necessary first to excavate the whole of each weld and then re-weld completely. The whole operation involved experts in many fields who brought their considerable knowledge to bear on the problem. In order to satisfy the Safety authorities each weld and its adjacent H.A.Z had to be inspected before repair and after re-welding to the very high standards called for by the Inspection Qualification requirements. The task of designing and producing an automated inspection manipulator and ultrasonic probes capable of operating at elevated temperature with high accuracy and repeatability fell to Phoenix Inspection System Ltd. In order to satisfy the stringent inspection requirements it was necessary to produce a manipulator, which was capable of operating with accuracy and repeatability at both ambient temperature and at 170ºC. Before starting the repair a full ultrasonic inspection was to be carried out at ambient to obtain a bench mark for the remaining inspections. The weld was then to be excavated and another full inspection carried out. Although this second inspection was to take place at ambient temperature it was complicated by the fact that it was necessary to ensure that the ultrasonic probes did not fall into the excavated weld prep. After welding, but before post weld heat treatment, a full inspection then had to be carried out with the boiler surface at 170ºC. This was to be followed by a further full inspection after post weld heat treatment, again carried out at 170ºC. A final inspection was then to be completed at ambient before the station returned to full power. Following the successful repair it was intended to use the equipment to monitor the condition of the welds during the remaining life of the plant. The equipment, which was designed and manufactured by Phoenix ISL to carry out these inspections is now known as "TRAKIT". The design requirements placed on Phoenix were to produce a system which was capable of continuous operation at high temperature over many hours and which could be operated within an area of restricted access. It had to be capable of being located accurately to within ± 1mm of a fixed datum within a set up timescale of 10 minutes by two people. This was no mean feat as it is a very large manipulator: the circumferential band is over twenty-two metres long and the probe holders, motors and electronic circuitry weigh some 20Kg. Added to which the system had to cope with the fact that there was a considerable amount of electrical noise caused by welding carried out in the vicinity. In addition to this, stringent Health and Safety standards had to be complied with because of the high temperatures involved. The design and construction of the complete system had to be completed for a fixed price and produced within the very short time scale of fourteen weeks. The system consisted of lengths of curved circumferential track fitted with adjustable magnetic feet, circumferential and axial drive mechanisms, pulse/echo and TOFD probe pans and probes, an air cooling supply, electrical umbilicals, a couplant supply system with couplant and air umbilicals and curved couplant collection trays. For hot scanning the couplant used was a silicone oil compound whilst for ambient scanning a water based gel was used. The couplant supply system had different couplant cylinders and umbilicals for the oil and gel. The scanner was designed to fit within a small envelope, which was defined by the positions of horizontal support beams and vertical pipes running close to the boilers. In order to keep the amount of insulation removed from each side of the weld to a minimum the scanner had to fit partly over the insulation. In addition, to reduce heat loss during the hot scans, only a limited area of the boiler was exposed at any one time yet the system had to inspect the maximum possible length of the exposed weld. The system was designed to operate with any multi channel flaw detection system with a DC servo controller. It can be configured to perform axial scans with circumferential increments and vice versa. The probes were required to work in contact with the boiler surface at a temperature of 170º for many hours without the application of cooling liquid. The inspection procedure called for pulse/echo, skewed pulse/echo and TOFD probes operating at both ambient and 170ºC. Twelve probes were deployed at any one time in pulse echo and six in TOFD. The specification called for triax ultrasonic probe leads and full electrical insulation of the probes so that welding and inspection could be carried out simultaneously on the same vessel. On occasion welding took place within three metres of the probes during inspection without degradation of the ultrasonic signals. The manipulator was required to deploy two types of couplant. For ambient operation a water-based gel was used and for operation at high temperature a specially developed silicone oil was provided. The manipulator was designed so that no cross contamination of couplant occurred. This was achieved by using separate couplant manifold and supply systems. Finally, nearly 100% couplant recovery had to be achieved because of the high value of the silicone oils, to prevent contamination of the insulation and to avoid any possible deleterious effect on the boiler steel. The circumferential guide track was constructed form modular extruded and rolled aluminium section, hard anodised and fitted with an integral rack. It was attached to the sides of the shell using high temperature magnets, which located on studs welded to the boiler. Because of the age of the boilers it was anticipated that they might not be perfectly round and in addition it was not possible to weld the studs on the shell with the required accuracy. Allowances had to be made for this by providing adjustment between the track and the magnets. This was achieved by locating the magnets on the studs via cups, which fitted loosely over the studs. Course and fin adjustments were used to align the track accurately. The design also had to ensure that repeatable and rapid alignment to the datum was possible. This was achieved by designating one of the studs to be used as the datumon all subsequent inspections. Cable management was particularly difficult to achieve under the prevailing conditions and which was further complicated by the high temperatures involved. Finally, it was necessary to protect from heat the more delicate parts of the manipulator, in particular the electronic circuitry, encoders and motors. This was achieved by the use of air-cooling and skilfully designed heat breaks. Stainless steel was used widely and knife-edge contact between parts was used wherever possible. Plastic bearings and silicone seals were used in strategic areas. These and other design features resulted in a temperature gradient of 150ºC between the probes on the boiler surface and the outside of the scanner, a total distance of only one hundred millimetres. In order to be able to carry out probe changes whilst at high temperatures, the probe pans could be removed without disturbing the rest of the scanner thus avoiding loss of positioning if this operation had to take place during a scan. The probes were kept in contact with the undulating surface of the boiler shell by means of constant force springs used in conjunction with tool posts which could pivot in two planes. The whole system was designed and commissioned in 14 weeks for a fixed price. It operated under the most adverse conditions for twenty-four hours a day, seven days a week for nine weeks. The time for a complete scan of the weld in pulse/echo was ninety-six hours in the hot state and thirty-six hours at ambient. The TOFD scans took thirty-one hours hot. The total distance scanned during the operation was twenty-seven kilometres of weld at ambient and thirteen kilometres at high temperature. This was the first time that extended automatic ultrasonic inspection had been carried out at these temperatures. The probes, which were designed to operate at 270ºC, experienced no difficulty operating at 170ºC even with out cooling. There were no equipment failures and no personal injuries during the inspection and all programmes and cost targets were met. 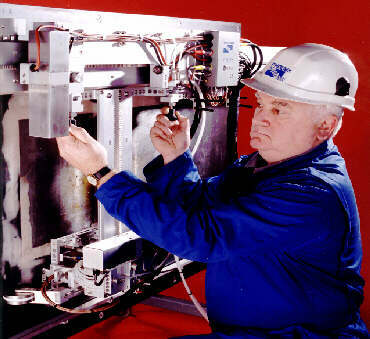 As a result of this exercise a modular, high temperature general purpose weld inspection system was produced capable of inspecting general fabrication welds. Because the scanner uses the same track as the welding head and the system can operates at high temperature, welding and inspection can be carried out at the same time.